New England (+5.5) at Arizona: The public is going to be down on the Patriots without Tom Brady in charge. This is our first real chance to decide whether that is warranted or not. It's a tough one - the Cardinals are a very good team and have been strong at home. New England would be in a tough spot in this one even with Brady at the helm. My initial reaction, though, was that New England would have been an underdog of less than a field goal with Brady in charge - +2.5 felt about right. So this means that Jimmy Garoppolo is, according to these odds, a field goal worse. Given the amount of time that the backup has had to get ready, and how smart this team is at game planning, that seems like a bit too much. There is some value in New England here. Jacksonville (+4) vs. Green Bay: The Jaguars have invested heavily in defense again, and they have a quarterback who should be established and much more comfortable in his first season. I know that Green Bay is a good team, but the Jaguars will be looking to make a statement here, and they should be a dramatically better team than we are used to. I am always intrigued by home underdogs, and in this case we have one that warrants a long look. Kansas City (-7) vs. San Diego: I am really quite optimistic about the Chiefs. If they can finally stay healthy then this should be the best team Andy Reid has fielded. They have nice talent on both sides of the ball, and they had a solid offseason. On the other hand, I am not at all optimistic about the Chargers. There is very little that I like about them at this point, and their coach is very likely to be on a hot seat as soon as things go wrong - which should start in this game. 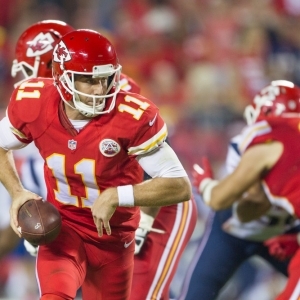 With the strength of the Chiefs on both sides of the ball, this one could be a big blowout. I'd take the Chiefs now before the number gets bigger than it is. Oakland (+1) at New Orleans: The rampant love for the Raiders is a little concerning - they are still the Raiders, after all. There is a whole lot to like, though. They have a great QB who should move forward nicely. The skill positions around him are easy to trust, and they have strong talent on both sides of the ball. The coaching situation is better than it has been as well. New Orleans, meanwhile, has a chance to be really lousy. Drew Brees is not young, and he doesn't have a ton to work with - at least not to compared to what he has had in the past. The team could fall off the rails in a big way. At this point in time the Raiders are the biggest bargain on the board in my eyes. I love this price. Minnesota (-3) at Tennessee: I like a lot about what the Vikings are doing right now. They have a quarterback who I expect big things from, and they have some nice talent around him - talent that has improved this year. Mike Zimmer has done an extremely good job coaching this team in his first two years, and I look for him to take a step forward again this year. Tennessee has done some things well, but they are a long, long way behind the Vikings in terms of development. This is more points than I like to give up on the road in a lot of cases, but as long as it stays on the key number and doesn't get bigger I'll take it. Minnesota is a nice play. Miami (+10) at Seattle: There are a lot of things I don't like about the Dolphins, but they made a very good coaching hire, and I expect a clear and much-needed change in attitude from the team. The Seahawks are the better team, but they make me uneasy going into this season. They still have nice pieces, but there are more and more clues coming out that they might be poised for a slight step backwards. I'm not suggesting that they are going to be terrible or anything, but after years of performing at such a high level they could be in line for a slight step backwards before they regroup and attack again. We've seen that from other top teams. What that all means is that 10 points seems like a whole lot - for both teams. I see some value in Miami.